This week Sequential Fiction celebrates our one year anniversary. It’s been a year since Brian saw Kevin Smith at the Windsor Comicon and took up the challenge to create a podcast. One year after we went live with our first Sequential Fiction, how have things changed? 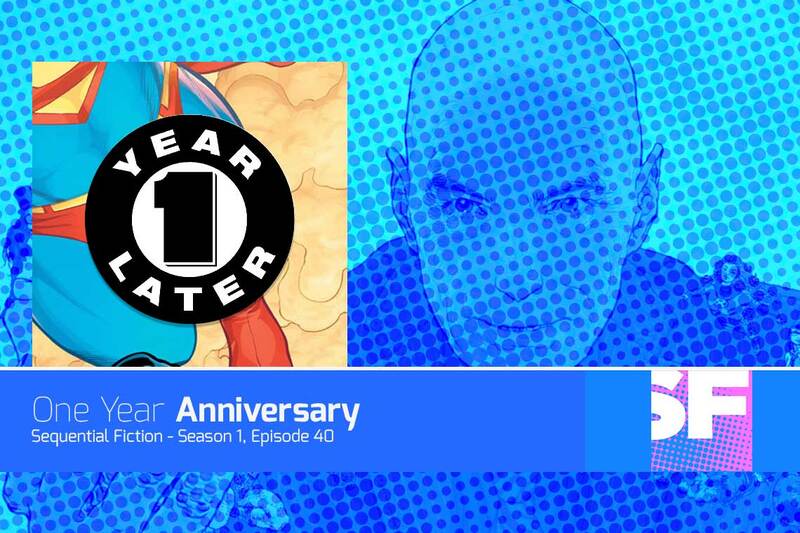 In this show we tease Fan Expo Canada, talk about our first year, our favourite episodes, and then we get to our cover story. Brian and Liam debate their five favourite comics writers. This week Sequential Fiction is brought to you by Manage Comics. Does your local comics shop have an easy to use online subscription tool that lets you manage your own subscriptions, that tells you what’s been pulled, and gives you info about what is coming up? If not, tell them to check out Manage Comics at managecomics.com. It’s easy to use for them, and gives you a better idea of exactly what you’re collecting. Manage Comics makes comic collecting better. We’ve been doing this a year now, we’ll do an entire episode on our favourite episodes, but I was just wondering what are some of your highlights from the last year? “THE RETURN OF WALLY WEST” part two! As the Titans prepare to do the unthinkable in order to defeat the intergalactic demon that stole time itself from the DC Universe, enter the Fearsome Five! But are the sinister quintet acting of their own accord…or are greater forces at work? When the Belgian cartoonist Peyo created a village of cute little woodland creatures for his heroes Johan and Peewit to discover, he couldn’t have known that they would wildly outgrow those humble origins to become a worldwide phenomenon all on their own. More than 50 years later, The Smurfs continue to delight us all with their silliness, bravery, heroism, and heart, and now we finally have a definitive collection of Peyo’s original comics to see where it all began. With introductions by Smurfologist Matt. Murray. Brian and Liam also briefly talked about Cerebus, and discussed dedicating an entire episode to Cerebus. Cerebus is now available digitally online at Cerebus Downloads for very reasonable prices considering many of the “Phone Book” editions are now sold out. Liam and Brian talked about their favourite writers and found some strange comparisons. For Brian, he realized that all of his favourite writers really found their stride in the last decade. Meanwhile, Liam realized that more than half of his favourite writers were writer/artists, a class of writer he had long dismissed.